Giuseppe Peano was an Italian pioneer of mathematical logic and the axiomatization (see axiom) of mathematics. He studied at the University of Turin, later becoming a professor there. 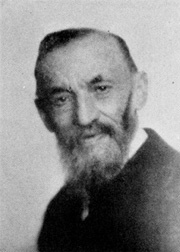 In 1889, he published his first version of a system of mathematical logic in Arithmetices principia, which included his famous axioms of natural numbers, now known as Peano's axioms. Two years later, he established a journal, the Rivista, in which he proposed the symbolizing of all mathematical propositions into his system. The project, which became known as the Formulario, was his chief focus for the next fifteen years. Peano's ideas profoundly influenced those of Alfred North Whitehead and Bertrand Russell. He also devised the international language Interlingua, still occasionally used.